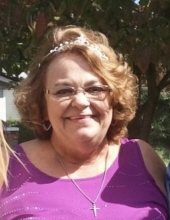 Beverly Ann McHone, age 71, widow of Charles Burton McHone, passed away Friday March 15, 2019 at her residence in Berea, Ky. Mrs. McHone was born Oct. 23, 1947 to the late Ed Blair & Mary Lake Blair Reed. Beverly loved to cook, loved the Ky Wildcats and watching Nascar. She liked spending time with friends and especially her grandchildren. Beverly is of the Baptist faith attending church at Galilee Baptist Church. Mrs. McHone is survived by one daughter, Lisa McHone Gatliff and her husband Billy of Berea, their children (grandchildren) Hannah Peterson, and her husband Kyle, Holly Gatliff, Daisy Gatliff, Zoe Gatliff, grandchildren (great grandchildren), Noah Peterson, Paisley Peterson, and Agatha Smith. Also surviving are three sons, Robert McHone and his wife Dixie of Berea, and their children (grandchildren) Jacob, Julie, Jeffery and numerous grandchildren (great grandchildren), Edward McHone and his wife Tammy of Berea, their children (grandchildren), Lucas, Dustin, Emily, and Kenneth McHone and his wife Tracy of Berea, their children (grandchildren) Christopher, and Kimberly, step mother, Evia Blair of Roundstone, three sisters, Pat Marcum, Judy Fowles, Peggy Brock all of Berea, one brother, Mike Reed of Florida, former grand son-in-law Nicholas Smith, and most special aunt Shelby Croucher. To send flowers or a remembrance gift to the family of Beverly Ann McHone, please visit our Tribute Store. "Email Address" would like to share the life celebration of Beverly Ann McHone. Click on the "link" to go to share a favorite memory or leave a condolence message for the family.